N 54° 05' 23.0" W 009° 02' 52.0"
A front view of this magnificent wedge tomb. Unfortunately the Fógra sign is way too close to the monument. This nice wedge tomb still boasts its original cairn, a feature that most of the other megalithic tombs have lost. In two words it's perfectly preserved. The inside of the tomb is quite neat, only some ferns grow inside, but in comparison to some tombs that are turned to trash dumps, this is a little jewel. The only extraneous object inside the tomb is the metal bar that runs across the ceiling and that is used to support one of the capstones, but it is pretty well concealed, almost invisible, and only a careful inspection reveals it. 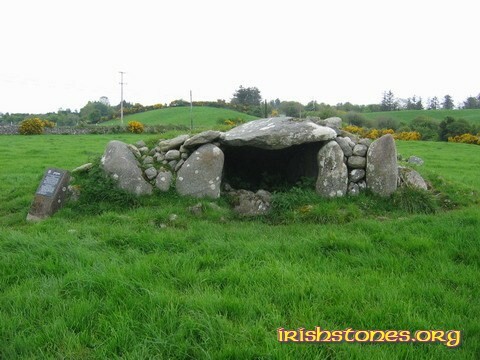 The wedge tomb is 6 metres long, 5 metres wide and 1.40 metres tall and faces southwest.